US ▼ 2013-05-16 $2.99 ? UK ▼ 2013-05-16 £2.99 ? EU ▼ 2013-05-16 €2.99 ? JP ▼ 2013-05-17 ¥250 ? (Sega Forever) 2017-06-21 FREE ? 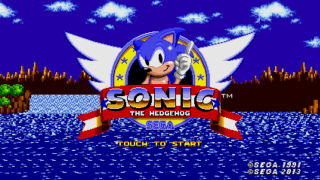 The 2013 release of Sonic the Hedgehog is an enhanced downloadable remake of the 1991 Sega Mega Drive game Sonic the Hedgehog. It was published by Sega for iOS and Android devices in May 2013. This particular version of Sonic the Hedgehog was developed by Sonic Retro Tech Members The Taxman and Stealth, using a proprietary game engine named the "Retro Engine" (an updated version of that seen in the 2011 version of Sonic the Hedgehog CD and fangames such as Retro Sonic Nexus). It replaced the 2009 iPhone release of the game (handled by Backbone Entertainment), and rather than rely on emulation, is specifically tailored for the hardware, offering enhanced features and new modes of play. 2013 Sonic 1 features a number of enhancements such as widescreen support, online leaderboards, filters to change the way the game is displayed, and extra gameplay-related bonuses such as a Spin Dash option, and a widely enhanced debug mode. When the game is beaten once, Tails and Knuckles can be unlocked as can the Sonic and Tails combo seen in Sonic 2 and Sonic 3. Using the aforementioned debug mode, along with other hidden features, you can also uncover the ability to use super characters, as well as interact with objects never seen in, or scrapped from, the original game. With the exceptions above, it is otherwise faithful to the original game. It also addresses multiple bugs, and boasts a constant framerate of sixty frames per second. In 2017, the app became free with the other Sega Forever apps. Users who installed it for free now have ads and previous paid owners can restore their purchase to make the app ad-free. The music has been remastered for the new release, but otherwise remains completely faithful to the original game. Spikes on the wall and Rings in the air that can only be reached by Tails or Knuckles have been added above the Lamppost between the two S-tunnels near the end of Act 1. The GHZ boss now sports a more realistic looking ball weapon. Until releasing said weapon, he can no longer be attacked prematurely. Also, due to the widescreen format, he moves across a slightly wider field and isn't quite as easy to defeat quickly. The aforementioned ball can be spawned in the middle of a level. When spawned, it rolls along slopes on its own, and can be pushed by the player as well. Pushing the ball can destroy badniks, monitors, and the breakable walls. Funny enough, it can also travel through the S-tunnels. The ball is also capable of crushing you. Finally, you can stand on top of the ball and move it by walking along it. Doing so must be done carefully, as the character can easily fall off. The scrapped Splats badnik can also be spawned, sporting 2 different variations. One will simply hop forward, not stopping to turn around for pits or anything of the sort. The other will take a couple hops one way, and switch direction. Crumbling cliffs now sport the same mirrored sprite for both directions, instead of their own sprite. Due to shading appearances, the latter would make more sense. This can be classified as a bug. Climbing/Flying to the top of the wall in Act 1 now reveals a hidden invincibility box. Attempting the same in Act 3 reveals a brand new path to explore, exclusive to this release. The previously scrapped sideways spiked stompers can now be placed in the level via Debug Mode. Finally, a UFO object can also be placed, which will create rotating UFO sprites in the background, not seen anywhere before except in beta screenshots and mockups. In Act 2, if one flies upwards just before the slope area leading to the 2 exits, another exclusive new path can be found, leading to a THIRD exit! In Act 3, flying up above the block path leading to the boss, Tails can find a Ring Monitor. It is just below where the extra life can normally be found with Sonic in the original game. This boss fight has been slightly modified, with two block barriers surrounding the battle arena. Using Debug Mode, the Goggles monitor can be placed in the level. It serves as a Shield, but while it will constantly protect the player, it only appears underwater. At the end of Act 1, the lower path to the exit now has a signpost. In Act 3, the sprite that appears when the character falls is affected by what sprite the character has when he falls at the end of Act 2. Knuckles can appear falling from a glide, and Sonic and Tails can appear with their carrying sprites, albeit not flying together, resulting in a small bug. Instead of just appearing and standing, the character springs up out of the floor at the start. Due to the widescreen nature of the game, you can now see a trapdoor lock as you enter the battle arena. On the opposite side where Eggman appears, the metal pod slides open, revealing the doctor, post-fight. A seventh Special Stage containing a cyan Chaos Emerald has been added, in the case of the player uncovering the hidden Level Select and selecting 7 Max Emeralds. If 7 Max Emeralds is selected, the player can turn Super after completing all Special Stages. When 7 Max Emeralds is selected, the pink emerald changes to purple to match the modern Chaos Emerald colors. While Debug Mode is enabled, monitors can be used more than once. The Level Select menu style is taken directly from Sonic 2, including newly made zone icons for the Sonic 1 zones. Player options now include Sonic/Tails, Tails Alone, and Knuckles. Tails and Knuckles have their movesets from Sonic the Hedgehog 3, allowing them to get to areas that Sonic cannot normally access. Sonic & Tails Mode now lets Tails fly Sonic around without the need for a 2nd Player. By hitting Up and Jump when Tails is airborne, he will take off and if you jump to him he can carry you as in Sonic 3. There is no NATIVE support for playing as Knuckles and Tails (there never was), but it's still possible to do so by use of the Level Select menu. Select Tails and Sonic, boot into the level select (see "Cheat Codes") and set player to "03". The game will be set to play as Knuckles with a Tails assist. The Sonic 1 title screen changes depending on which character is selected. Also found in the Level Select menu is an items option. You can choose S1, S2, S1+S3, or S2+S3. Options with S1 will result in S1 style monitors, a S1 style shield, and S1 style invincibility. Options with S2 will result in S2 style monitors, a S2 style shield, and S2 style invincibility. Options with S3 will result in blue shields being replaced entirely with Elemental Shields and Sonic gaining the Insta-Shield move. Extra monitors can be found in Debug Mode, including the old S monitor, which grants 50 rings and an instant Super form. Also found is a switch monitor, which switches the S1 Blue Shield with the S2 Blue Shield. Another one is what looks to be a Spike Monitor of some kind. Hitting it switches the "Spike bug" from the original version of Sonic 1 on or off. Finally there is what looks to be an Emerald Monitor, which plays the sparkle sound from Sonic 2 for Super Sonic and is assumed to toggle the maximum Emerald count. The Spin Dash option also alternates the spike damage behavior of the game. With Spin Dash on, the 'spike bug' will not appear, and you will be invulnerable for a limited time when you fall in a pit of spikes. With Spin Dash off, the 'spike bug' will appear, with you dying immediately when you fall in a pit of spikes. Start a "No Save" game with any character. Using touchscreen: Once the Sega logo appears, tap the letters S-E-G-A in that order. If done correctly, a chime will sound. Then on the title screen, tap the screen with two fingers and hold down one finger near the lower-right corner of the screen. Using gamepad: On the title screen, press Up, Down, Left, Right. If done correctly, a chime will sound. In the level select screen, play sounds 04, 01, 02, 06 in the sound test. You will hear the sound of collecting a Chaos Emerald. You will now have all of the Emeralds when selecting a level. Play sounds 01, 09, 09, 01, 00, 06, 02, 03 in the sound test then select a level. To enter debug mode tap in the upper left hand corner of the screen. A minus sign (-) and a plus sign (+) will appear. These can be used for navigating back and forth through the debug items. To exit the level and return to the level select screen, tap the upper right hand corner of the screen. To enter normal play again tap the upper left hand corner of the screen. Start a "No Save" game and choose a character. Once the Sega logo appears, tap the letters A-G-E-S in that order. If done correctly, a chime will sound and the credits will appear.